With population of approximately 1.75 million, waste management is one of the most serious challenges confronting the local authorities. The daily solid waste generation across Gaza is more than 1300 tons which is characterized by per capita waste generation of 0.35 to 1.0 kg. Scarcity of waste disposal sites coupled with huge increase in waste generation is leading to serious environmental and human health impacts on the population. The severity of the crisis is a direct consequence of continuing blockade by Israeli Occupation Forces and lack of financial assistance from international donor. 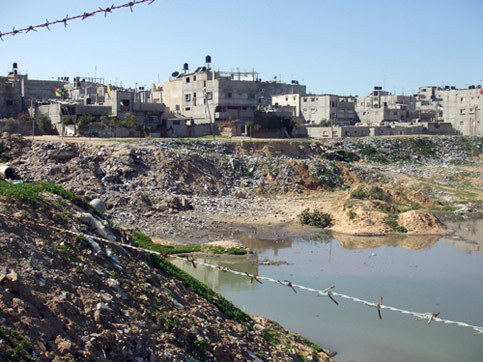 Israeli Occupation Forces deliberately destroyed most of the sewage infrastructure in the Gaza Strip, during 2008-2009 Gaza War inflicting heavy damage to sewage pipes, water tanks, wastewater treatment plants etc. There are three landfills in Gaza Strip – one each in southern and central part of Gaza and one in Gaza governorate. In addition, there are numerous unregulated dumpsites scattered across rural and urban areas which are not fenced, lined or monitored. Around 52% of the MSW stream is made up of organic wastes. Domestic, industrial and medical wastes are often dumped near cities and villages or burned and disposed of in unregulated disposal sites which cause soil, air and water pollution, leading to health hazards and ecological damage. The physical damage caused to Gaza’s infrastructure by repeated Israeli aggression has been a major deterred in putting forward a workable solid waste management strategy in the Strip. The sewage disposal problem is assuming alarming proportions. The Gaza Strip’s sewage service networks cover most areas, except for Khan Yunis and its eastern villages where only 40% of the governorate is covered. There are only three sewage water treatment stations in Gaza Strip – in Beit Lahia, Gaza city and Rafah – which are unable to cope with the increasing population growth rate. The total quantity of produced sewage water is estimated at 45 million m3 per annum, in addition to 3000 cubic meters of raw sewage water discharged from Gaza Strip directly into the sea every day. Sewage water discharge points are concentrated on the beaches of Gaza city, Al Shate’ refugee camp and Deir El Balah. The continuous discharge of highly contaminated sewage water from Gaza Strip in the Mediterranean shores is causing considerable damage to marine life in the area. The beaches of Gaza City are highly polluted by raw sewage. In addition, groundwater composition in Gaza Strip is marked by high salinity and nitrate content which may be attributed to unregulated disposal of solid and liquid wastes from domestic, industrial and agricultural sources. The prevalent waste management scenario demands immediate intervention of international donors, environmental agencies and regional governments in order to prevent the situation from assuming catastrophic proportions. BioEnergy Consult | Powered by SANICON Services & WordPress.